Building community from the ground up. Kale as a crop has been in cultivation for over 2,000 years. 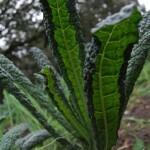 There are presently over 50 varieties of Kale that come in a range of colors from green, purple, blue-green, and white. Part of the Brassica family like cabbage, bok choi, and broccoli; it is the oldest member to be cultivated. Like other Brassicas, Kale it is full of antioxidants, nutrient dense and is linked to cancer prevention. It’s also one of the richest vegetable sources of calcium, protein and it contains vital minerals such as iron, magnesium and potassium. While not only being very good to eat, it also easy it grow. Kale is a hardy crop that can even grow with light snow on it and actually sweetens with frost. If kept in good health, Kale can grow continuously for over a year. During WWII, Europeans were encouraged to grow this hardy Brassica in their backyards to supplement their diet during times of strict rations and lack of fresh produce. Short-Term Storage: Loosely wrap kale in a damp paper towel and refrigerate in a partially open plastic bag, reusable container or salad spinner for use within a week. For long term storage, Kale may be frozen. Thoroughly clean kale by dunking it in tepid water several times and then rinsing under cold running water. Small kale leaves can be used whole. The larger leaves should be stripped or cut from the center rib. The rib can be chopped into small pieces and cooked with the leaf or discarded. To shred the leaves, place them in a pile, roll up, and then thinly slice them. 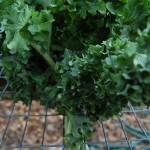 Baby kale can be used raw mixed with other greens in salads. Mature kale must be cooked, as it is too tough to consume raw. It can be steamed, but tastes best when boiled or simmered in vegetable broth. Boiling Kale: Pour one cup of water and one-quarter of a cup of vinegar in a large pot. Bring to a boil and cook until the vegetable turns bright green in color. However, kale can also be boiled quickly, about 5 to 8 minutes, until it is just slightly crunchy. Sautéing Kale: Boil the kale first for about 5 minutes to enhance its flavor. Then sauté in oil with onions and garlic for about five minutes. 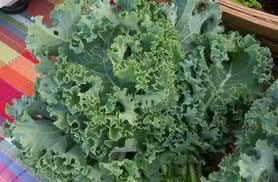 Microwaving Kale: Place the kale, with just the water clinging to its leaves, in a covered microwave-safe dish. Cook on high for 7 to 10 minutes, stirring after 4 minutes. Let stand covered for 3 minutes before serving. Tips: You can sauté or steam kale and get good results, but the down side to steaming and sautéing is that these cooking techniques concentrate the bitter compounds into the leaves. Since kale is not an overly bitter green, this is not a huge problem, particularly if you have a tasty sauce or seasoning. If you want to minimize the bitterness, the best cooking technique is to simmer the kale in a little bit of water for 5 to 10 minutes. This will cause some of the bitter compounds to be drawn out of the leaves and into the water, giving the leaves a less bitter taste, and a nice flavorful broth. If you toss the boiled water down the drain when you're done, you will be tossing away some of the nutrients as well, but if you drink the broth (either by putting in a glass and drinking it, or serving it with the kale as a sort of stew/soup, or using it in another soup), you will not lose any of the nutrients.